Build a clean, fully correlated dataset of event and visitor data for analysis and action in real time—all delivered to you in a format, schema and time increment that fits your organization’s unique needs. Receive raw or ready-for-analysis data in real time – Get data in the format you want without requiring processing by correlating and enriching data at the point of collection. Power enterprise data investments with comprehensive and high-quality data – Build a rich, unified source of cross-device and omnichannel data primed for use in any data warehouse backend or any intelligence and reporting tool. Increase data agility to adapt to customer behavior and technology trends – Create a source of data that expands with your evolving business requirements from the source. As flexible as it is powerful, the Tealium DataAccess™ solution stores and distributes your data in the ways necessary to support a modern real–time customer data supply chain, which makes real-time customer data available for use anywhere in your organization. Marketers can continue to use the tools they know and love, such as Google® or Adobe Analytics®. While data analysts and business intelligence (BI) experts can work with the same source of data using visualization tools, such as Tableau® or Domo®, they prefer in their enterprise data warehouse (EDW). Don’t rely on siloed, channel-specific vendors to store and analyze your valuable first-party data. Managing customer experience with vendor-centric data practices produces inconsistent and uninformed marketing actions across channels, in addition to siloed internal teams. Without taking steps to own this data flowing through vendors, you may be stuck buying back your own data for use in analysis. Take ownership of that data, build it around the customer and continually improve it to drive customer experience by creating a centralized data supply chain. Traditional data platforms are plagued by fragmentation problems leading to many downstream issues. Siloed data collection leads to uncorrelated datasets and batch processes that cause backward-looking, out-of-date analyses. Compounding the problem, the resulting insights can’t be built into a timely and automated data ‘action’ because of these same fragmentation issues. Tealium’s real-time approach to data collection, correlation and enrichment eliminates the speed barriers by generating the richest customer data at the point of collection and making it available for instant analysis by leading BI/EDW platforms. This same data that powers analysis can then be connected directly to external systems to drive customer experience action in real time. Most companies struggle with silos of uncorrelated data created by a variety of key systems that are adopted over time to address changing customer behaviors and evolving technology. 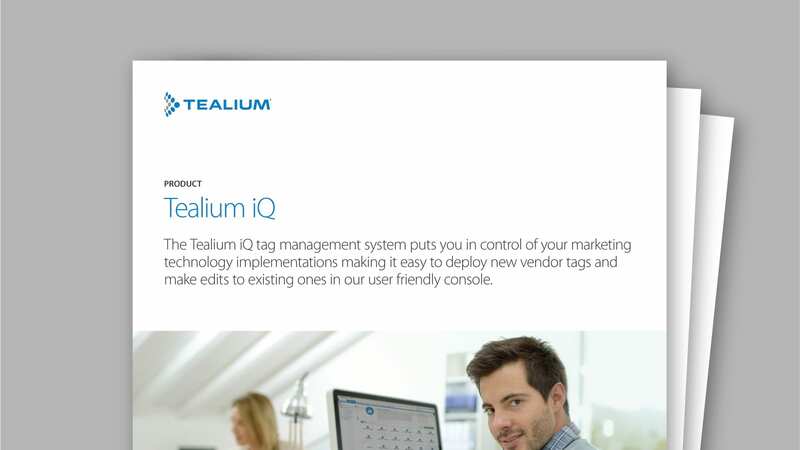 DataAccess leverages the Tealium iQ™ tag management system, Tealium EventStream™ API Hub, and Tealium AudienceStream™ customer data platform to collect data generated from cross-device, omnichannel and omni-source interactions across all customer touchpoints. The data is collected live and fully correlated across the entire customer journey upfront, so you don’t have to cobble it back together after the fact, allowing you to avoid slow and costly post-processing. You can take full advantage of your customer data without the time consuming, inaccurate, and resource–intensive data integration processes typically used. Most vendors offer rigid and static datasets with proprietary data elements. By contrast web, mobile and offline data captured by Tealium is transformed into a customer-centric dataset in real time across the user journey. You can use Tealium iQ or EventStream to instrument and translate data at the source or AudienceStream to define new customer attributes such as metrics, badges or traits as the event level data is transformed into visitor profiles. AudienceStream can also be used to merge offline or off-site customer information as well, thus making the dataset fully extensible to accommodate new business requirements. In addition, this data is automatically activated to fuel live marketing interactions such as personalization, remarketing, retargeting, offer management and more. Now the data you use for analysis is the same as the data you orchestrate and take action with. Don’t start over; start smarter. Your existing investments in customer insight technologies and customer engagement platforms will be more valuable when you leverage DataAccess. All the data available through this product fully complies with industry standards and global collection and storage best practices. Use the storage, engagement and visualization tools you already have or investigate new ones whenever you like. Tealium is 100% agnostic when it comes to the tools you choose to use and supports over 1000 integrations. DataAccess offers a variety of ways to put your customer data to work for you. First, choose semi-structured or structured data. The data schema is up to you. Decide whether to store event-level data, audience-level data, or both. Do you want it in real-time or in some time-based increment? Do you want to host the data or have Tealium host it on your behalf? When you choose the Tealium hosted option, we automatically transform, load and store the data into a standard cloud-based data warehouse, ensuring that your data is properly collected, correlated and made available for immediate use. All you need to do is point your favorite reporting, analytics, or visualization technology at your new live data warehouse in the cloud. Unlike some data platforms, Tealium does not lock your data into proprietary systems. DataAccess is an open platform that lets you access your data in a variety of industry standard formats.